Acoustics in the workplace is something that may often be overlooked but much research and various studies have been conducted regarding the effect of acoustics and how it influences productivity and wellbeing. It’s acknowledged that workers consider they could be more productive in a less noisy or acoustically treated environment meaning it has become an important topic for consideration. We have carefully selected a range of acoustic products below which can be applied to various applications and environments. If you are considering an acoustic treatment our independent acousticians are available to offer advice or conduct on-site acoustic assessments. We looking forward to hearing from you. BuzziSpace are a Belgian company formed in 2007. They have developed and created an impressive portfolio of innovative solutions and products, with focus on sound absorption or acoustics for offices, working environments and the home. Their products are unique but also functional, making them instantly recognisable due to the unique production methods, designs and materials employed. The brand provides new ways of working, living and being sustainable. Acoustic desk top screens may be the quickest and least expensive way of addressing excess noise within the office as they are usually situated within close proximity to the source and offer a suitable barrier to break reverberation. Normal desk top screens offer a division and creation of work areas whilst acoustic screens absorb excessive noise as they have acoustic properties such as foam core, porous weave fabric and other tested materials. Acoustic screens that can also be used as literature displays in a choice of three colours and manufactured in Sweden for a 20 -25 day lead time. Comes with a five-year factory guarantee. 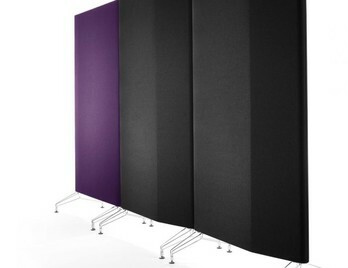 Acoustic screens 60mm thick and filled with mineral wool sound absorbing material. 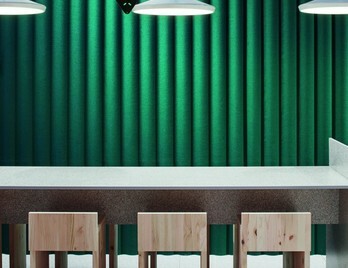 Covered in sound absorbing acoustic felt in a choice of three patterns and four colours. 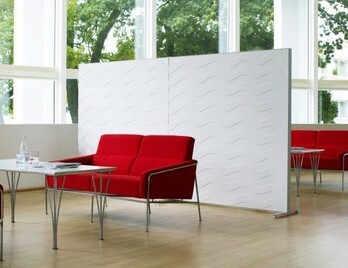 Alumi is a flexible freestanding screen for the office as well as for public areas. The filling inside the screen is made up of mineral wool which offers high sound absorption and the framework and edge is made from aluminium, which means it is very light weight yet solid in its appearance. 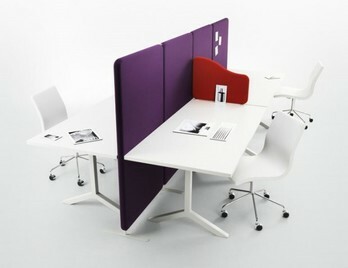 Simple flexible and elegant office screen solution consisting of straight and curved panels as well as desk dividers. 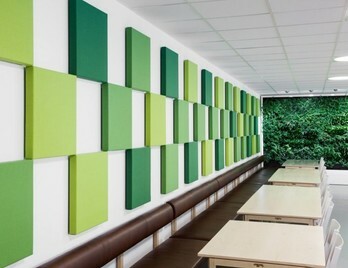 Sound absorbing class A 50mm thick acoustic panels consisting of fireproof mineral wool. Available in Event and Atlantic fabrics. Also available Softline frozen a fabric with a printed flower pattern. Made from fully recyclable materials, these acoustic screens feature a dot, wave or block pattern and feature a frame that is available in a choice of Birch or Oak frame. Delivered free of charge to the UK mainland. 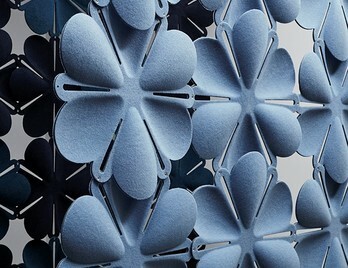 Sound absorbing screen made from moulded fibre felt. 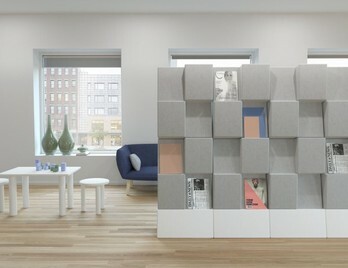 This modular system is built around the shape of a hexagon in a variety of designs and colours which can be freely combined to create a screen. 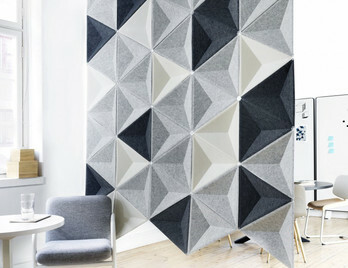 Sound absorbing screen made from moulded fibre felt. Airflake can be used in many different ways to create visually stunning spaces within the room whilst diffusing unpleasant sound reverberations. Airflake is suspended with the help of an aluminium rail or with ceiling brackets and hooks, please see optional extras. The modules are assembled and connected using plastic connector pegs which are included. 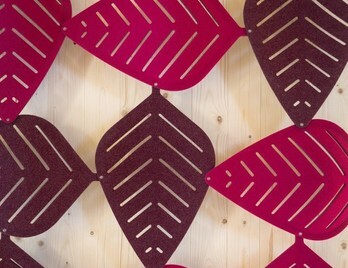 Airleaf is a sound absorbing leaf made from moulded fibre felt. 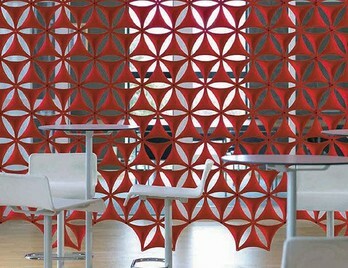 The leaf-shaped modules can be combined to create a number of sound absorbent patterns and formations. Airleaf can be made to create aesthetically pleasing backdrops with excellent acoustic properties and gentle visual aesthetic. Airleaf can create a soft barrier or screen whilst still allowing light to seep through, replicating the natural light properties of trees and leaves. The innovative Aircone is based on the success of the Airflake and made from a simple moulded fibre felt. 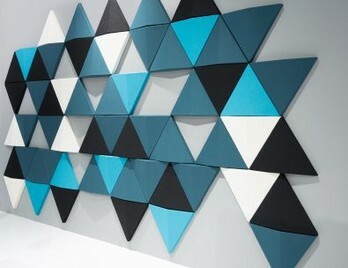 The Aircone modules can be combined to create a number of sound absorbent patterns and formations. Aircone can be made to create aesthetically pleasing backdrops with excellent acoustic properties with an interesting geometric visual aesthetic. Aircone can create a soft barrier or screen with each module being joined together by small. 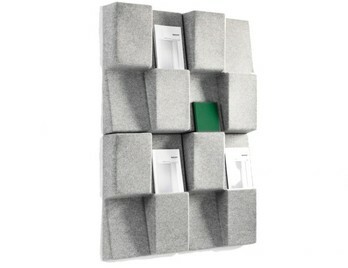 Airbloom is an innovative product from the Air family and is manufactured from moulded felt. 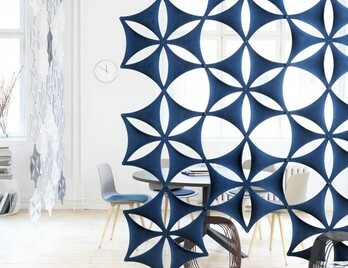 The Airbloom modules can be combined to create a number of sound absorbent patterns and formations. Airbloom can be made to create aesthetically pleasing backdrops with excellent acoustic properties with an interesting natural visual aesthetic. Airbloom can create a soft barrier or screen with each module being joined together by small plastic connectors. Designed by Anya Sebton. The triangular shape provides additional sound insulating properties. It consists of a fabric panel of fire retardant mineral wool. The displaced triangular shape gives an outstanding relief pattern when the screens are placed next to each other. The Softline 30mm is the new updated depth from Softline 50mm screen resulting in a neater, sound absorbent screen. Simple flexible and elegant office screen solution consisting of straight and curved panels as well as desk dividers. Sound absorbing class A 30mm thick acoustic panels consisting of fireproof mineral wool. Available in Dox, Salsa, Event and Atlantic fabrics. Baffle panel is a patented acoustic Snowsound® panel designed to hang from the ceiling which demonstrates its lightness and elegance. 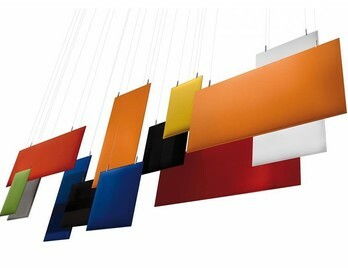 The cables can be adjusted in height and different compositions can be created as the Baffle Hanging Panel is available in various sizes and different coloured fabrics. These panels come with the necessary fixing kit and cables to enable installation. Tri-Wall Panel triangular shape gives a playful and attractive impression whilst efficiently breaking up sound waves, therefore, contributing to better acoustics within the room. The Panel can be hung both horizontally and vertically using suspension fittings offering many different combinations and patterns. The Tri-Wall Panel's shape and texture offer a visual anchor point for any wall with light and sound reflecting satisfactorily upon its geometric surface. 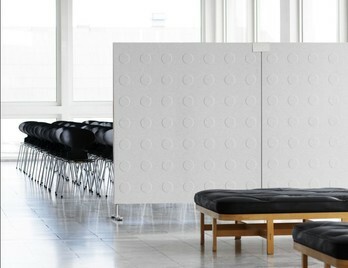 Soneo wall panel is a stylish yet simplistic way of introducing wall panels to your workplace in order to absorb any reverberation or sound waves a bare surface would be subject to. Available in different sizes and in two different thickness at 50mm and 100mm with the thicker panel being more absorbent. Triline Wall Panel is a rectangular moulded panel which can be mounted either horizontally or vertically making a stunning visual effect and symmetrical and asymmetrical patterned formation. Due to the wedge-like appearance, when combined they form multiple surfaces for sound to reverberate from. The panels are easily installed with concealed suspension rails. 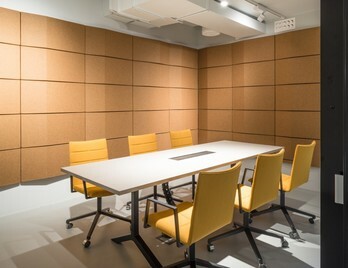 The panels consist of a sound absorbent filing fitted within an MDF frame covered in designer Blazer fabric from Camira. Window Wall is dual purpose sound absorbent wall-mounted structure which also doubles up as a useful and aesthetic magazine holder. This type of solution works well in public areas, reception areas and libraries. Scala Wall is from an interesting range called Scala which takes its inspiration and form from corrugated iron roofs, a material sometimes used on houses in Iceland. 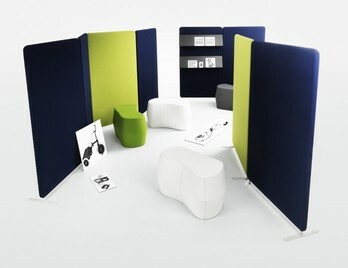 These acoustic panels are easy to install and can be applied in many different environments. 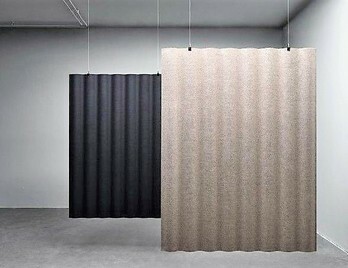 Scala Suspended Screen is from an interesting range called Scala which takes its inspiration and form from corrugated iron roofs, a material sometimes used on houses and roofs in Iceland. These acoustic suspended panels are easy to install with black hanging fixings and can be applied in many different environments. An obvious indicator of excess reverberation or simply ‘excess noise’ is the loss of hearing speech accurately in occupied spaces such as offices or restaurants due to background or ambient noises. Sometimes it can be difficult to understand a conversation and words even when that person is at close proximity. Have you ever been in restaurant when you cannot hear the person next to you due to the sound of voices, laughter, chinking of glasses and clattering of plates? These noises are excessively reverberating from all the internal hard surfaces, within the restaurant such as the tables, walls and ceiling and results in what we, as customer’s experience as ‘too noisy’. It’s the same within offices and it’s important to identify where you think the hard surfaces are in relation to the source and to imagine the noise or sound waves bouncing of that hard surface and in to somebody’s working space. Could these echo’s or bounces be prevented? If so they would definitely enhance the working environment for everybody making communication easier due to the ambient noise being softer. These noises can take a long time to die down otherwise without suitable acoustic solutions in place. Acoustic solutions are designed to absorb these reverberations and most have been scientifically tested to prove that they really are quite effective. We now offer a wide range of acoustic treatments and can in some cases provide you with a free acoustical survey making sure you have all the right acoustical elements to eliminate and reduce noise. Please get in touch if you feel your office or organisation could benefit from any acoustical treatments.